Tai Chi can be done at Any Age. Image by Wikipdia. The Calm Chicago center offers three types of classes: yang 24 short form, 18-form qigong and yi jin jig. They also offer classes in meditation, sitting, standing, walking. They also have a Facebook page and wordpress blog. Find out how to get to the school here. What does Calm Chicago Offer? From the Calm Chicago website: Teaching and practice at Calm Chicago focuses on the simple and practical. We offer stress reduction and whole body health via taiji, meditation and qigong. Our teaching leans on a traditional pattern, passed from generation to generation, teacher to student. We emphasize learning by direct experience not from reading in a book or analyzing with the mind. Our classes allow you to : Restore the unity of your mind and body. Enter the natural peace and quiet of your own mind. Balance, strengthen and relax your whole body. Get healthy and stay healthy. Dump stress. Think more clearly. Respond more calmly. Leave feeling refreshed, invigorated and calm. We offer group classes, private lessons and corporate stress reduction programs. Steady programs of stress reduction utilizing taiji, qigong and meditation, helps keep employees happier and healthier. Find out more about the Calm Chicago teacher, Hillary here. Cost of the classes is $20 a class for drop-ins and $100 a month for a once a week class. (Note: There is a one time membership fee of $50 to cover liability insurance. It looks like its cheaper to drop in after that though unless you have 5 days a month to attend! More tuition info here. Beginner classes are offered on these days and times: Saturday 3:30-4:45pm and Sunday 10-11:15 a.m. Beginner classes offer a gentle introduction to 18-form qigong, Yang 24 form taiji and meditation. Advanced classes are offered on Sundays from 11:30am -1pm. 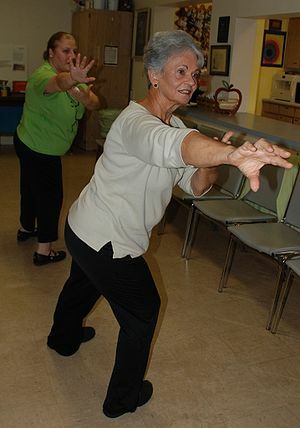 Read about the upcoming (4-30-11) World Tai Chi Day in the their blog here. For a great explanation of what Tai Chi Is (from the what it’s not perspective!) click here. Finally had time to stop in and say thank you formally for posting this. So generous. We’re definitely looking for folks to join us for World Tai Chi Day on April 30 and to support that I’ll also be adding a new FREE 30 minute class soon. The focus will be on using very traditional follow-the-leader technique for learning the form. It’s a great way to get a taste of tai chi and really fun in a group. So, news on when that class will happen is coming soon. I love your blog as a source for all kinds of general health info. It’s a valuable tool. Again, many thanks. Thanks for reading and providing such a valuable class to stressed our Chicagoans! Let me know more about the free 30-min class and I can spread the word to interested readers! I read through the various responses to your posts about Wii Tai chi and DVD tai chi and so on… and while I really do appreciate the fact that people may not want to venture out of the house or apt. or condo for a workout, in the gym with weights, machines or otherwise … in the end, there is a genuine limit to what we can learn from a recorded lesson regardless of the area of study. A recording can give you a start, but can not tell you, “yes, that’s right,” or, “no, a little more this way or that that way.” It can not answer your questions or provide the deep, personal feedback of a skilled instructor or (and very lovely to experience 1st hand) it can’t give you the feeling of peace, energy and support of practicing with others. So, where ever you are, I strongly suggest you find a good teacher near you, in whom you can place your trust as a guide. Ask to visit a class and observe. See how the teacher teaches. What is the atmosphere in class like? There are so many teaching styles, as well as tai chi styles. I don’t say one is right or wrong. There is only what feels like a good fit for you. I try to teach a group no matter how large or small with a personal touch, getting to know each student at least a little bit from the very first class. While there is a curriculum, I teach to what is happening or seems about to happen, being flexible to conditions in each moment. My goal is for each student to have good experience from the first class, to cultivate peace each session, to provide our time together as something different from the world out there with it’s concerns for the bottom line. In my experience, some students pull back from the class room and talk about dvds because maybe they are shy or self conscious. In this case, private lessons are an excellent way to begin. And then, I regard it as my job to make the open classes as welcoming as possible. No matter who walks in, we make you feel welcome. World Tai Chi and Qigong day is Saturday, April 30th, 2011. We’ll meet in Chinatown Square at 10 am for a free open class to celebrate the day. To prepare we offer free classes Wednesday (6:30 am, more of the follow the leader style class, very traditional but different than my usual classes) as well as private lessons and our usual classes on Saturday (3:30pm) and Sunday (10am). Please contact me with any questions via the website (calmchicago.org). We look forward to seeing you. More news to come as we offer more classes starting in March and April. Thank you for your excellent tips and reminders of the upcoming World Tai Chi and Qigong day! While I agree that studying with a teacher is optimal, for many people, it’s is not an option. Those with tight schedules and children may not be able to get out to a class. I want to offer them alternatives so that their choices are not 1. be a super serious student or 2. don’t experience Tai Chi or Qigong at all. The same goes for yoga classes and weight training and other forms of exercise. For people going from no exercise to starting a fitness/stress reduction regime, Wii Fit and dvd’s offer them a way to exercise or at least try out a new exercise. If they really like it, they may convert to in person classes. What would be great is if you made house calls for private sessions or could offer group classes in condos or exercise rooms in high rises. Just a thought. Hi Sue, I hear you! People are so busy. In fact I do make house calls for private sessions. And would love LOVE to do group classes in condos, high rise exercise rooms, organizations etc. It is very much the way I’ve been heading – so a fortuitous observation. Any ideas/referrals specifically? I’d certainly be interested in creating something jointly. I have some leads I’m following at Sofitel/South Loop and Whole Foods on Roosevelt. If you’d like, maybe you and I could make a time to meet and share a little of what we do. Be delighted to teach you some if you’d be interested. Sure we could work something out that way. Flexibility in teaching style, location and so on is really such a tai chi concept…deep adaptability. Great to know you do in home classes and condo sessions! Meeting you would be great but time does not permit right now. If you want to chat about coop marketing, drop me an email at info@workingwellmassage.com. Also, Sue, just did a refresh of the web site with new class times, etc… http://www.calmchicago.org. I’m always eager to hear what people want so I can try to create those classes and styles of study that match what people can do and will fill the need for finding stress relief that works for them. So let me hear everyone! Thanks Hillary! Keep up the great work!